According to research conducted at Harvard University, omega-3 fatty acid deficiency is officially one of the top 10 causes of death in America, claiming the lives of up to 96,000 people each year. Out of the 12 dietary, lifestyle and metabolic risk factors examined in the study, omega-3 fatty acid deficiency ranked as the sixth highest killer of Americans. (1) These deaths are considered preventable since getting enough omega 3-fatty acids in your diet can ward off this now common cause of death, and fish oil benefits omega-3 intake as a potent omega-3 source. Most of the fish oil benefits exist because it’s one of nature’s richest sources of omega-3 fatty acids. While certain fish oil claims aren’t accurate, I will go over the proven scientific evidence that demonstrates the true benefits of fish oil. Fish oil is a concentrated source of omega-3 fats, which are also called ω-3 fatty acids or n-3 fatty acids. To get more scientific, omega-3s are long-chain polyunsaturated fatty acids, or PUFAs. Our bodies are able to make most of the fats we need need, but that’s not true for omega-3 fatty acids. When it comes to these essential fats, we need to get them from omega-3 foods or supplements. There are so many fish oil benefits. These are just some of the top scientifically proven fish oil benefits I want to make you aware of. The European Journal of Neuroscience published a study in 2013 showing that fish oil reversed all anxiety-like and depression-like behavior changes induced in rats. This is an interesting study because it stresses the importance of supplementing with fish oil at “critical periods of brain development.” (10) This is exactly why I recommend giving fish oil to our kids from early on to help them so they won’t develop anxiety or depression later in life. This is great news for both fish and borage oil when it comes to arthritis patients, but it’s critical to emphasize that the results were the same because taking too many supplements is simply a waste of money. For 21 days, a diet with fish oil or a standard American diet was given, and it was shown that dietary fish oils for colon cancer prevention was effective. “This could extend to other preventive agents that function by reducing inflammatory stress,” said the authors. Combined, this shows consuming fish oil benefits diabetics and that fish oil sources should be included as part of a diabetic diet plan. A higher intake of polyunsaturated fats like those found in fish and fish oils have also been linked to reduced levels of cortical cataracts. Salmon is a fish that naturally contains both fish oil and astaxanthin. I also recommending buying a fish oil supplement that contains astaxanthin. The health benefits of fish oil can be incredible for the body’s largest organ, the skin. This source of essential fats improves the health and beauty of human skin in several ways. Fish oil benefits and nourishes the skin with fats and contributes fat-soluble vitamins that help skin maintain a smooth, elastic texture. There is also evidence that fish oil prevents wrinkles and works against the aging process. The deficiency of EPA and DHA in diet contributes to skin conditions, such as dandruff, thinning hair, eczema and psoriasis, as well as age spots and sun spots. Without the essential fatty acids, too much moisture leaves the skin. The truth is your internal health can appear on your skin, and taking fish oil internally as a supplement may be as good as or better than applying conventional moisturizers. According to the National Psoriasis Foundation, fish oil can aid in preventing or slowing heart disease, which is especially great for psoriasis and psoriatic arthritis sufferers who are at a higher risk of developing heart disease. (27) When it comes to using fish oil supplements for the alleviation of psoriasis symptoms, studies have been mixed with some showing improvement but others showing no effect. If you suffer from psoriasis, you may want to try a fish oil supplement, or else I highly recommend that you make sure to have fish rich in omega-3s regularly. If you’ve been wondering, “What does fish oil do?” hopefully you now have a better idea of the very large array of possible fish oil benefits! The main nutritional value of fish oil is its high fatty acid content. As I just mentioned, fish oil benefits come from the fact that it’s rich in the omega-3 fatty acids known as DHA and EPA. Nutritional information varies by product and fish source. Check supplement labeling for specific details. 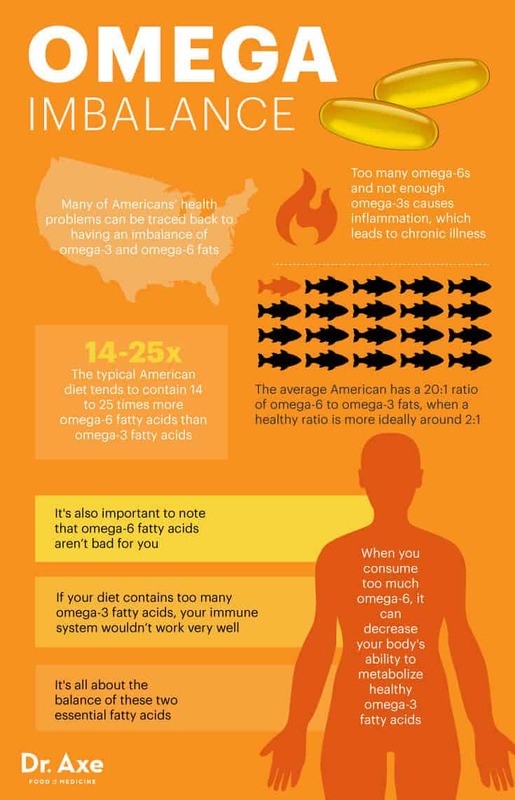 Many of Americans’ health problems can be traced back to having an imbalance of omega-3 and omega-6 fats. Omega-6 fats aren’t necessarily bad for you, but if they’re consumed in large amounts without omega-3s they cause inflammation, which leads to chronic illness. Today, the average American has a 20:1 ratio of omega-6 to omega-3 fats, when a healthy ratio is more ideally around 2:1. Put in other numerical terms, the typical American diet tends to contain 14 to 25 times more omega-6 fatty acids than omega-3 fatty acids. (35) This shows just how deficient most of us are and why supplementing with fish oil is so beneficial. Nonetheless, omega-6 fatty acids aren’t bad for you. In fact, if your diet contains too many omega-3 fatty acids, your immune system wouldn’t work very well. It’s all about the balance of these two essential fatty acids. Note that even though certain other foods like flaxseeds and grass-fed beef contain omega-3 fats, those omegas are alpha-linolenic acid (ALA) and not EPA/DHA like what’s found in fish oil. According to the medical research, there are far more health benefits in fish oil (EPA/DHA) than flax oil (ALA) for most people. Your best way to achieve a good balance of omega-3 and omega-6 is by getting your fish oil from wild-caught fish like salmon. However, I still think it is beneficial for some to supplement with a high-quality omega-3 fish oil or cod liver oil. Plus, cold water fish are frequently contaminated with mercury and pesticide residues, making it very difficult to safely achieve recommended levels. Therefore, supplementing your diet with pure antioxidant rich fish oil can be one of the best ways to get your omega 3s. The types of fish which are most commonly used in fish oil supplements are salmon, cod liver, mackerel, sardines, halibut, pollock and herring. When taking fish oil, more is not always better. Remember that you want it to stay in a balanced ratio with omega-6 fats. For most people, I recommend a 1,000-milligram dose of fish oil daily as a good amount and the most scientifically studied dosage. I highly recommend not taking more than that unless directed to under the supervision of a doctor. Also, not all fish oils are created equal. Most fish oils are highly processed and can oxidize easily because omega-3 fats are polyunsaturated, have a low heat threshold and can easily go rancid. For that reason, you want to buy a fish oil in triglyceride form that also contains antioxidants to preserve them like astaxanthin or essential oils. Does Fish Oil Cause Prostate Cancer?! What is a “mega dose”? The American Heart Association considers taking up to three grams of fish oil per day “safe.” It advises that “patients taking more than 3 grams of omega-3 fatty acids from capsules should do so only under a physician’s care.” (41) Most physicians would say that taking 2+ grams (or 2,000+ milligrams) daily is a mega dose. So do I think you should stop taking your fish oil immediately because of this study? No. But should you take a look at how much fish oil you take and what brand you take? Yes, definitely. The reason why fish oil could increase a man’s risk of prostate cancer is IMBALANCE. Like I said earlier, omega-6 fatty acids aren’t bad for you. In fact, if your diet contains too many omega-3 fatty acids, your immune system wouldn’t work very well because omega-3 and omega-6 fatty acids are meant to work in a system of checks and balances. Omega-3 fatty acids suppress inflammation, and omega-6 fatty acids promote inflammation, which actually supports your body’s natural system of defense like activating your white blood cells. So, if you consume too many omega-3 fats (EPA/DHA) you can actually weaken your immune system, which would encourage rather than ward off cancer. So I take this study to be a very good example of why more is not more when it comes to supplements, and you should be cautious not to overdo it with fish oil or any other supplement. If you’re not able to get enough fish oil benefits through your diet, fish oil supplements can be a good option. Fish oil side effects can include belching, bad breath, heartburn, nausea, loose stools, rash and nosebleeds, but in my experience, taking a high-quality fish oil supplement can reduce the likelihood of any unwanted side effects. It’s also a good idea to take fish oil with meals to reduce side effects. My estimate is that close to 90 percent of fish oils on the market today may contain mercury and pesticide residues plus hydrogenated oils. Of course, this is my opinion based on my own research from visiting different manufacturing plants, interviewing companies, and studying the research and the listed ingredients of typical fish oils. I would stay away from ALL fish oils that do not have antioxidants like astaxanthin, which help stabilize the oil from going rancid. I always look for astaxanthin as part of any high-quality fish oil supplement. To avoid fish oil supplements containing mercury or other harmful contaminants, purchase supplements from a reputable source that clearly tests for these health-hazardous contaminants in its products. These tests should be ideally conducted by a third-party, and a certificate of analysis should indicate the levels of purity from environmental toxins. Omega-3 fatty acids are essential to our health, but our bodies cannot make them so we must get them from diet. If diet is not enough to meet our needs, then a high-quality fish oil supplement is the next best option. The best fish oil supplement always ones manufactured under strict standards with thorough testing for health-hazardous contaminants like mercury. Post-supplementation “fish burps” can be avoided by consuming fish oil with food. Fish oils can be used as prevention to health problems as well as a treatment. Scientific studies have and continue to back up all of the incredible fish oil benefits ranging from eczema and fertility to heart disease and many types of cancer.